And thats just what I'll do... Im so not mad at Jessica Simpson for going into shoe - business. We all know that her last album was ahhh.. ehhh... but guess what, these shoes are just darling !!! So I am going to give her 5 gold stars for this pair. 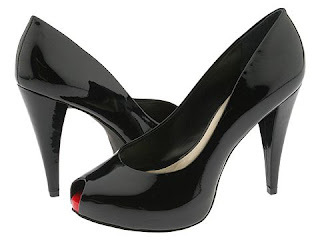 Who doesn't love a sleek black patent leather peep-toe pump?? You can never have enough black shoes, they're so classic and timeless. I will most definetly wear these on one of my next adventures!!! You too can channel your inner femme fetale and go to www.zappos.com/n/p/dp/22251106/c/89.html and get yourself a pair! !